The flower buds of yellow, violet, red and white crocuses of saffron bulbs intermingled with the blossoms of daffodils, hyacinths, tulips and Persian violets herald the arrival of Nowruz . 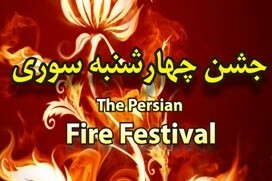 The Persian New Year, a rebirth and rejuvenation, rightly occurs on the spring vernal equinox. Spring in Iran begins jubilantly with the flowing pristine streams percolating down mountains, the greening of the prairies, the flowering of fruit trees, and the germinating of assorted crops. It is thus surmised that the Nowruz spring celebration must have been observed since the inception of agriculture in northern Mesopotamia and Iran for at least 10,000 years. 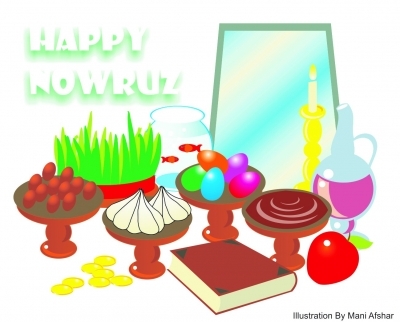 Nowruz in Persian literally means the first day [of the New Year]. It is the most prominent seasonal celebration of the solar calendars. It was conceived by the agricultural people north of the Tropic of Cancer who have revered the sun (sols invictus) , fire and light ever since. This contrasts with the lunar calendars as followed by the southern Semitic neighbors. 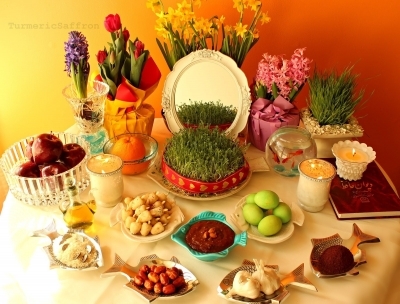 In addition to Iran, Nowruz as a national holiday transcending class, color, creed, ethnicity, race, religion, or national origin, is currently commemorated by well over a dozen countries of nearly three hundred million inhabitants in central, south and west Asia, northwestern China, Asia Minor, and the Caucuses. In fact, the commoners and serfs in Europe and later by the pilgrims landing on Plymouth Rock though the mid-18th century also observed a New Year beginning in spring. Have you ever wondered why the 9th through the 12th months of the current Gregorian calendar, Latin derived September through December, are actually the 7th through the 10th months of the year? Wouldn’t that make January and February the 11th and 12th, thus March the first month according to the Julian Calendar , an era in the 1st through the 4th centuries CE when Europe was still under Persian Mithraism influence?! 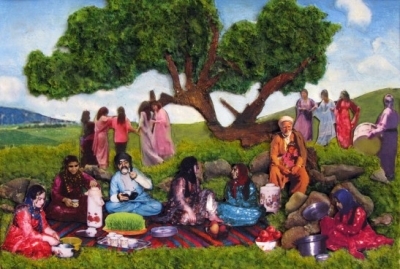 A Nowruz holiday is concluded at the Sizdah Bedar Picnic, which falls on or close to April fool’s Day. Every family spends the day outdoor in parks, crop fields, or the orchards, when they play, sing, dance, eat and drink. The singles tie knots with grass blades to wish for a life companion, the elders nostalgically compare this Nowruz with those passed while remembering the deceased with melancholy, and the children look forward restlessly to many more Nowruz celebrations to follow. Nowruz Pirouz va Khojasteh Bad !